I finished the afghan today, before the closing ceremonies started. So I reached all my Crochet Olympic goals. I'm already thinking about the next project, thinking of swatching stitches and yarns. I really need to take a few days and catch up on school work, grade papers, prepare lesson plans, etc. It certainly wouldn't hurt to a little cleaning up. Mainly putting away yarn, patterns, new books & magazines, etc. The Crochet A Long group started a "Blue Doily" from the March 2003 Crochet! magazine. I wanted to try this also, but started getting the magazine about Aug of 2003. So I looked at the books and magazines at the Gathering today, very little crochet because no crochet group there. Anyway, there were only 2 Crochet! magazines, and one was March 2003, snatched that up for a quarter! I also picked up 3 more balls of that Emmy Grande Lame thread. 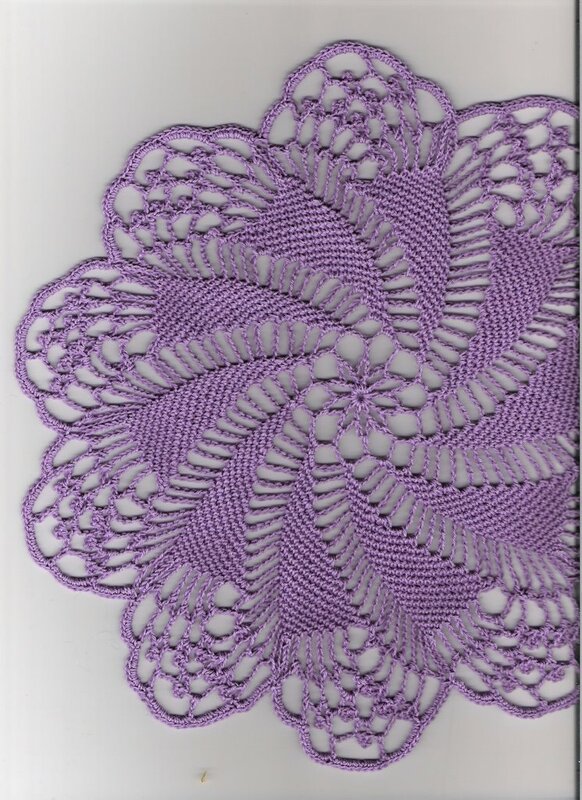 I had bought 1 in lilac and 1 in yellow at the Lace Guild booth at the Farm Show, not knowing what I was going to make but thought it would make a lovely doily. I started a doily, but the yarn is just too nice for a doily. It is gorgeous and would make a lovely doily, but the thread has 4% Spandex which gives it a nice gentle stretch which would be totally wasted on a doily. I started a swatch with the yellow using the spiderweb design. I thought it might make a nice bodice for a baby dress or sweater. It's absolutely wonderful, but the pattern is too deep for a baby bodice. I'm thinking a motif band at the bottom of a summer top. But making the entire top of this thread would be too expensive. Will keep thinking. Today, they had a little more of the Emmy thread, 1 of lilac and 2 of pink, so I bought them. I've found a website with the thread for sale, so if I decide what I might make, I know where to find it. I told you in January about going to the Farm Show and visiting the booth of the Keystone Lace Guild. I was attracted to the booth by the crocheted doily displayed front and center with a knitted doily and a tatted doily. I talked to the lady and the booth and was treated as a fellow lace maker. 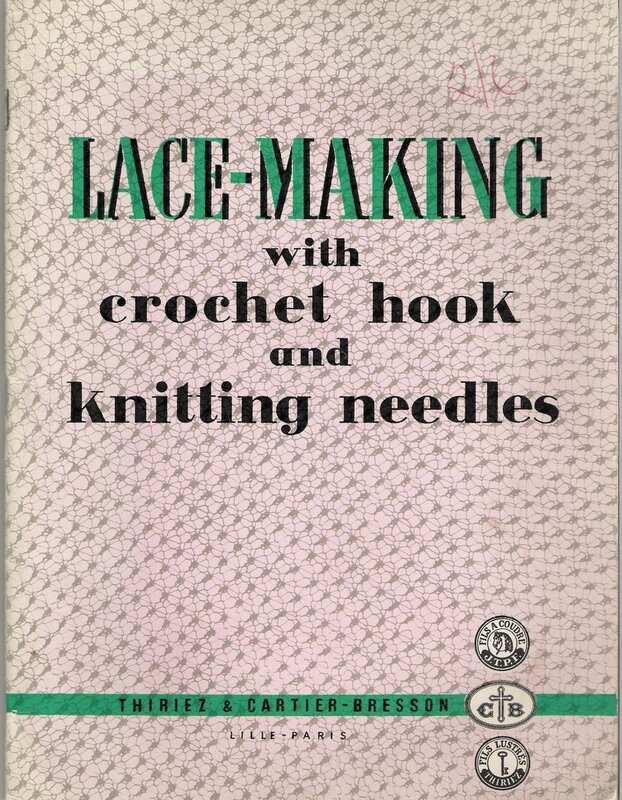 I was impressed, and interested in attending some meetings of the Lace Guild locally. Today was the Central PA Gathering of the Guilds, there were displays by all types of fiber guilds - embroidery, cross stitch, smocking, quilting, spinning, knitting,...but not a crochet guild. I definitely want to see CGOA represented properly next year. They also had Make It and Take It workshops, small items that were easy to do and could be finished in a short time. Some of the items were very cute, others didn't impress me; but I understand how the time and ability requirements limit the possible projects. I've started thinking about a possible workshop project before we've gotten a local guild chapter. If we're interested in a local chapter of CGOA, leave a comment. I'm interested in starting one. I finished the Snow Flower doily last night while watching bobsled. I pinned it out and blocked it between skaters on the figure skaters' champions gala. This is really a gorgeous doily. I am definitely planning to enter this in the Gratz County Fair and the PA Farm Show. Yes, I'm planning ahead! Well, a light spritz of water, a light steam and I left it pinned about 1/2 an hour. Unpinned it & it's nice & flat. I worked 2 of the ruffly rows, worrying all the time about the small amount of thread left. Finished with about 8 " left. 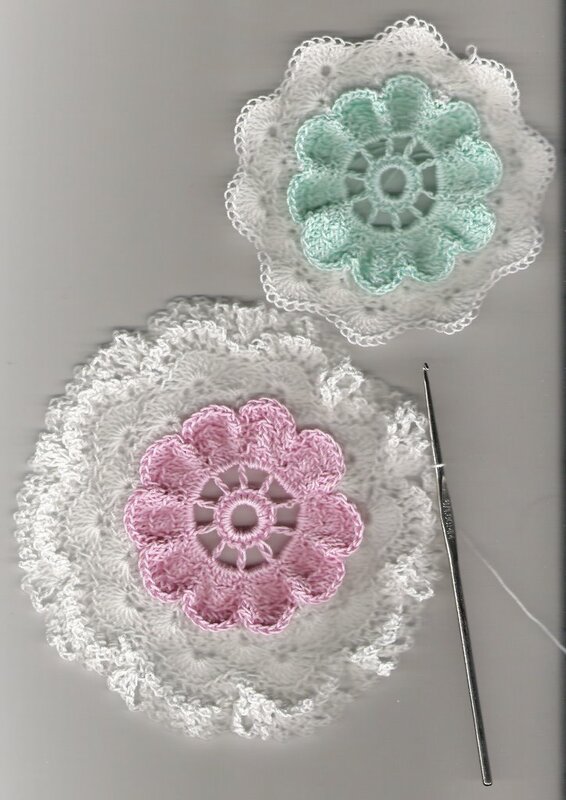 What to do about the last row?...Oh, see that other doily I started, with the green center, I just pulled out that white. Hope that's enough for the last row. 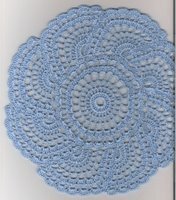 During commercials in the Olympics I worked the picot row on the doily. It called for an sc, ch 5 and slip stitch in the first ch. The picot was not as neat & tight as they usually are. The top didn't have a nice point, and the center chain opened up too much. I tried an sc, ch3, slip; then an sc, ch 3, sc - that let the scs slide a little, still too open; then tried an sc, ch 4, and sc into the side of the first sc instead of the chain - that's a pretty picot! And an sc into the side of a stitch is so much easier than a slip into a chain. When you have over 400 picots, it's nice to have one that works up easily. I just have the 3 ruffly center rows to do, but decide to do a light blocking first. I gave it a light water spritz, and gently stretching and the ruffles came out. This is going to be a beautiful doily when finished. Pictures later. 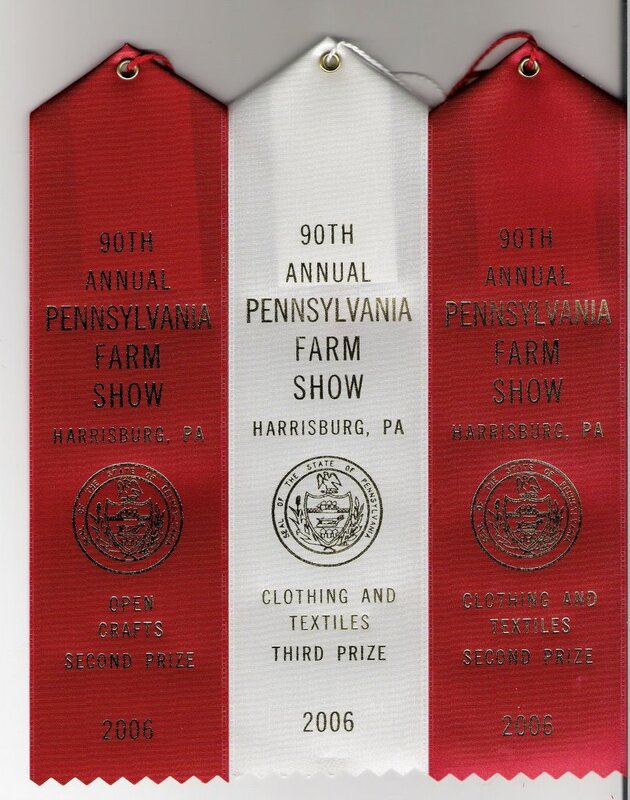 Today's mail brought the ribbons I won at the PA Farm Show. I thought it would be nice to have a photo of the doily with the ribbon won. They're flat and I can scan them easily. If I want to add a photo of the baby dress, booties and ribbons, I'll have to get the camera out, and find a nice backdrop. Anyway, here are the ribbons. Despite it being Olympic week, I'm sticking to the old adage that slow and steady wins the race. I am working the last outside round of the doily, it's basically picots, it's going to take some time to get around it. The pink center rows were worked in back loop only, then I have to go back and add white ruffles to three center rows. Here is a picture, it's unblocked. Hope that the blocking can stretch out the center & middle to show the pineapples to advantage. The outside has a beautiful ruffle, that's funny, there's no ruffling in the picture. I like the ruffle, though, I just might block it and use cotton balls to shape the ruffle nicely. A reader was kind enough to comment & let me know that the couch dress was a spoof. I hadn't checked out the rest of the website. A fellow crocheter had posted the link to the dress in a group posting. I clicked on the link and looked at that item only. The entire site is a little wacky, but they have a map with directions to a store. Do they really sell things like that? Or is it simply an attention grabber and the store sells normal things? I don't have a clue. Ok, now we've seen everything. This company has stitched together about 5 afghans, mostly ripples, all colors. Then they've attached them to a custom fitted dress bodice, and they're selling them for $349.00!! Well, maybe they're not selling them, they are offering them for sale. Would anyone really pay this much for this product? Would anyone wear it? Wait a minute, how do you put this dress on? What happens when the phone rings, the tea kettle whistles, or you have to go to the bathroom? And if your skirt is 4 full sized afghans, why are your arms bare? Let's all wrap an afghan around our shoulders, pull the afghan we're crocheting up on our lap and keep warm while we work! We'll be smart, and save money. 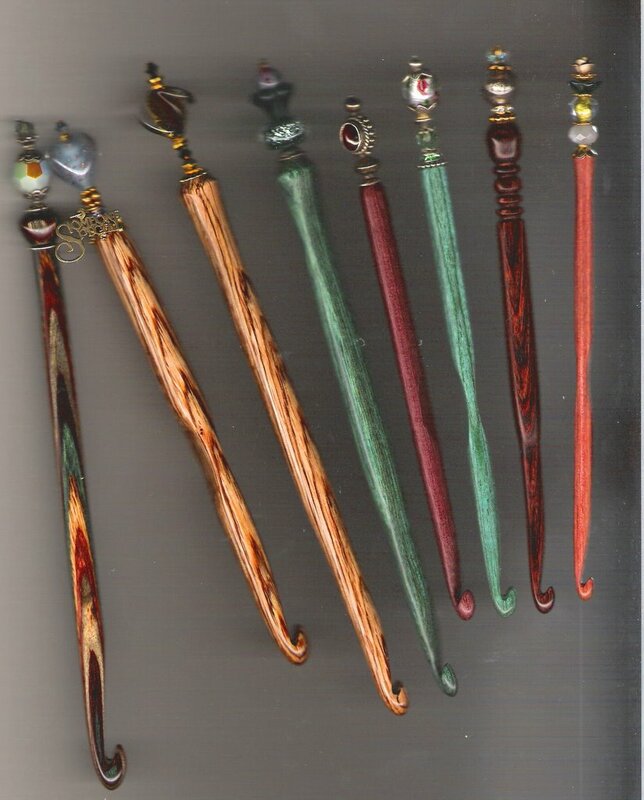 I'm playing with my Sonshapes hooks, grouping them in different ways & scanning pictures. They're so pretty! Did I write about my birthday gift? My husband won a Sonshapes hook on eBay. It's a light wood, size M with a white-silver heart bead with gold specks, and a dangle that says "Someone Special". Now I'm searching for a pretty H hook. I have a very nice set G, I, 2 J's, K, L, M, N. So you agree with me, I need an H, right? 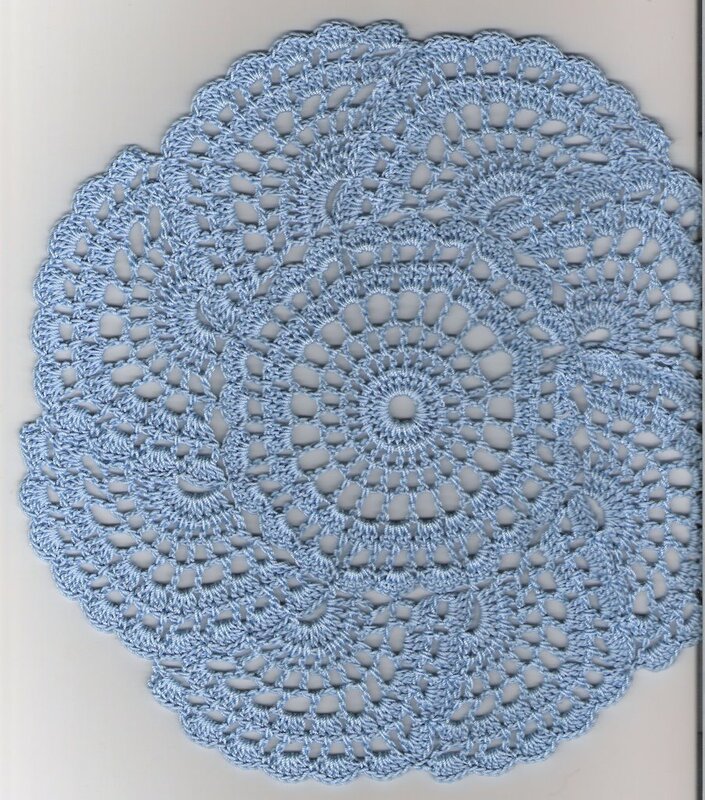 This doily was in the magazine Annie's Favorite Crochet in October 2000. It was designed by Lois Waldschmidt. Wed. Feb 15 - I worked from 4 - 8:30. Did a little bit of work on the Snow Flower doily. I know better than to work on something complicated while working. It was a slow night, so I only had to answer a few phone calls, and be available if the teachers needed anything, oh, and be available for homework assistance, and watch the over-active "studio baby" who is now 2 1/2. I supervised her mopping the bathroom floor! Olympics - moguls, downhill skiing, & more Okay, I stayed up all night watching! - Snow Flower doily - ripped back to the row I started at work after figuring out that something wasn't quite right. It seems that the Olympics has inspired many needleworkers to challenge themselves in their favorite "sport". It started with the Yarn Harlot's "Knitting Olympics" and the idea was to start a project with the lighting of the Olympic flame and complete the project before the flame is extinguished. Each knitter was to select a project that was a challange, and yet do-able for him/herself. Check out the list of names & their planned project, as of this morning there are 3,908 entries! Crocheters soon took up the challenge. Check it out "Crochet Olympics" Wow! They even have little medals "2006 Crochet Olympics Participant", "Team Wearables", "Team Doilies". Makes me wish I had signed up! I had too many projects on the hooks, and items in design stage to make a decision to work on only 1 project for the 16 days of the Olympics. I am making a great effort to pick up a project each evening while I watch some of the Olympics. 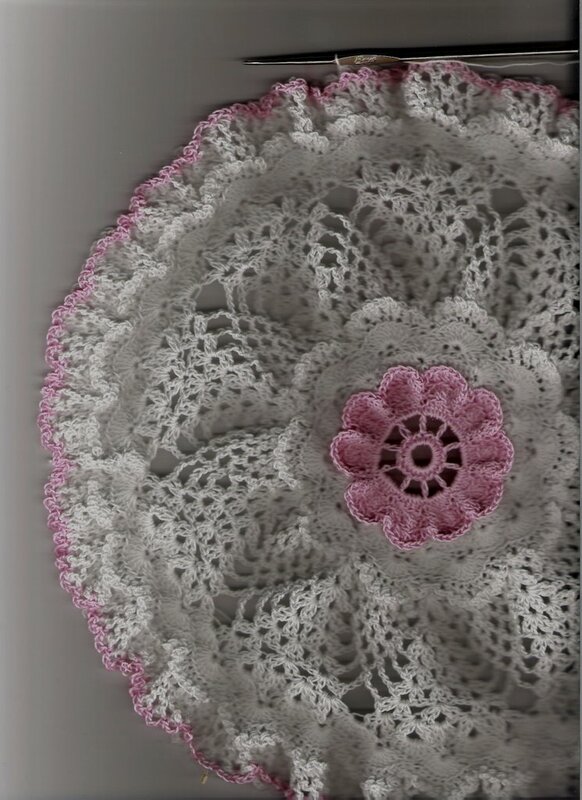 There's a great doily pattern that they call "Small Table-Mat in Crochet", that certainly needs a better name! I started making it in yellow (not the good stuff), thought I understood the directions perfectly, and thought I followed them diligently, but I came out with 6 shells around the centre, instead of 8. Started again in blue, and found my mistake. I made it with one round of shells, instead of two, I like smaller doilies. I plan to make at least one more of these, I have a creative variation that I think will be awesome. Must buy some other thread first. I have at least one ball of white that is trash-cheap. Away with you - tie up the tomatoes. My current thread/lace obsession has me searching eBay for interesting patterns and books. 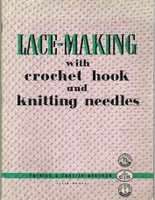 I recently purchased a booklet called Lace-Making with Crochet Hook and Knitting Needles, published by Thiriez & Cartier-Bresson in Paris. The copyright has no date, but includes the line "Copyright reserved in all countries, including U.S.S.R." From the look, I'm thinking that the book may be from the 1950's. I've tried a Google search, which brought back several library holdings, but not dates. If anyone has any info. I'd love to know more. I plan to take this along to the "Gathering of the Guilds". 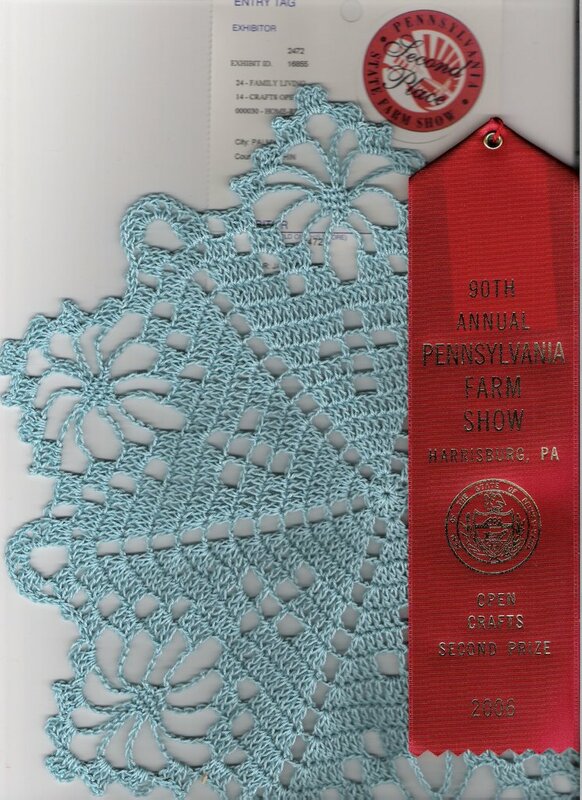 On Jan. 18th I wrote about the Keystone Lace Guild's booth at the State Farm Show, see "Lace Guild entry" That has inspired me to work with thread again. I've been having a lot of fun with the "Crochet-A-Long" doilies. I've also spent way too much time online searching for doily patterns. I talked about the beautiful thread I bought at the Lace Guild booth. I've had it sitting on my computer table in view so that I would remember to think about the perfect doily for this thread. I didn't want to ruin or waste this thread on just any old doily, I want to show off its beauty with a perfect pattern. Well, last night I thought I had found that pattern and started using the yellow thread on this doily. And guess what? This thread is just to lovely for a doily. The thread is soft, not stiff like many #10 threads. It's extremely smooth, has a nice glitter, and it has a nice stretch. I decided it would work nicely for a baby dress, or a yolk for a dress. As of last night, the yellow thread is in the beginning of an original design. I discovered a new blog and website that has a lot of really cute patterns. Ponchos, shrugs, hats, etc. Now I normally don't go for any of these items, maybe it's the cute kids that make the patterns look even cuter! I really like the Pink daisy Halter top, and the infants bathing suit cover up - I think it makes an adorable summer dress. 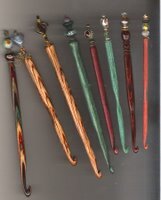 Lots of patterns for sale, and some great free patterns, too. 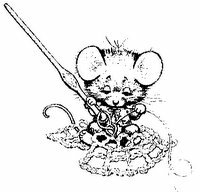 I've been searching for some crochet clipart to make this blog a little more interesting. Isn't this little guy adorable! I tried the Graphics Factory, entered the word crochet....and the results were croquet mallets! I sent them an email. Here is an activity I wish I could add to my schedule. It's strictly knitting, no crochet, but right now I'm trying to learn more knitting. I think it will help with things like garment fitting, drape, etc. But I also know that I can adapt what I've learned in knitting into Tunisian crochet - definitely my favorite crochet activity. I'd love to take the class Feather and Fan with Nancy Griffin, I've seen this pattern knitted at the Shawl Ministry and it's gorgeous. I'd love to do this in Tunisian, but can't find a pattern. One of the books I have from the library now is The New Knitting Stitch Library, by Lesley Stanfield. It has over 300 stitch patterns, lovely to look at. I don't like the fact that none of the stitch patterns are named, and that all the patterns are charted, not written. I'll have to learn yet another symbol system, because it's different than the crochet symbols, and I'm not a visual learner! Why couldn't they have included K2, P2, etc,...it's like a combination of English and algebra, I can read that! So, why can't I go to this Festival, it's a Friday and Saturday, I work Tuesday & Wednesday, I could visit daughter #2 (M) at college. But that Saturday is the Central PA Gathering of the Guilds. And I'm very interested in crocheted lace at this time, I'm definitely attending the Gathering of the Guilds. I've even arranged to meet a fellow crocheter, she's from the Pittsburgh area. and blocked. It looks great, I do love this design. I think I might make another one as a surprise gift for someone. Now, back to the afghan for daughter #2 (M). It's about 2/3 finished and looking fabulous.